Montessori Math: Multiplication by Les Trois Elles Interactive is a wonderful addition to their existing suite of apps. What we like best are the lessons with a variety of games to reinforce the concept, especially with the use of larger numbers. This is a great help in getting kids to think and estimate before pulling the trigger on an answer. Another aspect that sets Les Trois Elles apart from the many other math app developers is that they developed an innovative progression algorithm that follows each user's progress and adapts the games accordingly. There are four difficulty levels to test children of varying age and ability, and playful mini-games called Missing Digit, Whiz Quiz, and Bubble Games. The Monster Lab is designed to be a motivator and provides kids with a quirky environment to take a break and play with some monsters. 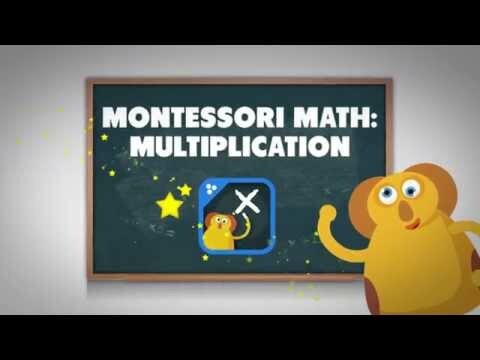 Montessori Math: Multiplication introduces multiplication in 4 different ways and offers 3 fun games and a monster lab to ensure the highest level of engagement, challenge, and progress. Designed by Montessori teachers, the app contains detailed tutorials for the right level of scaffolding to empower children. The Toolbox menu contains three visual tools that can help you understand the basic concept of multiplication. Montessori Math: Multiplication offers four stages of learning. It’s a great way to reinforce that multiplication is basically adding the same number over and over again. The app is completely intuitive and has a great look and feel to it. The kids we worked with seemed to favor the bubble game and we, as teachers, were delighted to see them playing with larger numbers... confidently. 15 languages: English, Spanish, French, Dutch, German, Portuguese, Italian, Swedish, Danish, Japanese, Korean, Chinese (traditional and simplified), Turkish & Russian. Retina display & Universal app (iPhone, iTouch, iPad, iPad Mini).